How To Jump Start A Car In Seven Simple Steps! Wallace Chevrolet > DIY > How To Jump Start A Car! Learn In Minutes! 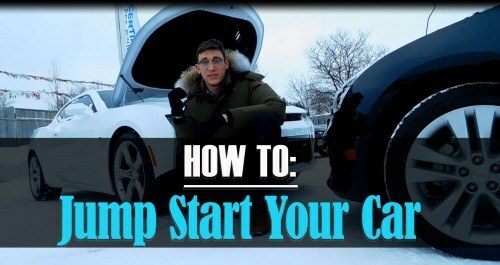 How To Jump Start A Car! Learn In Minutes! Using jumper cables to boost a vehicle is easy but if it’s not done safely you could get injured. Bookmark this page or print it out and put it in your glovebox so it’s always on hand (you may not always have cell reception)! Bring the vehicles close together and shut them off completely (don’t let them touch, it could cause a short). Ensure all auxiliary controls are also off (A/C, radio, etc…). Open hood on DEAD vehicle and connect the red clamp to the DEAD battery’s positive terminal (note ‘+’ sign). Don’t worry if you don’t find it immediately, it could be hidden under a small cover on the battery itself. 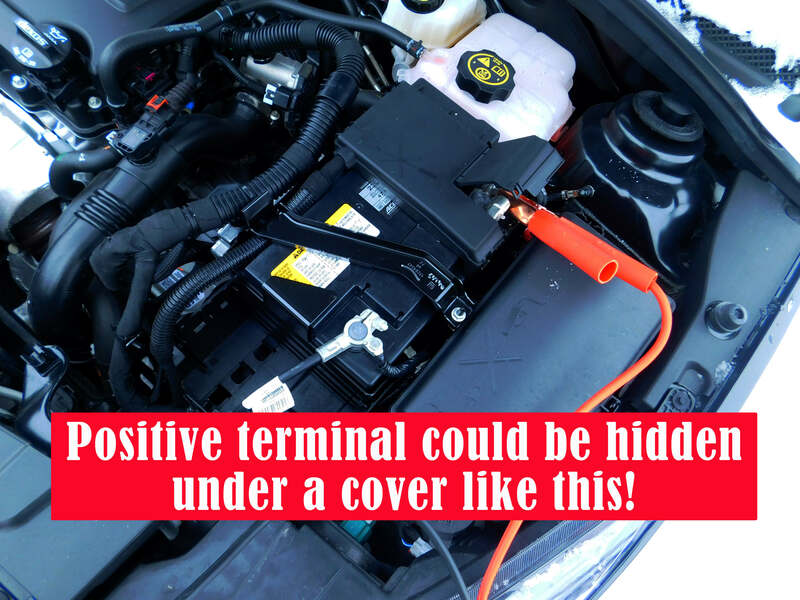 If you don’t spot the positive terminal (it should have a + sign on or near it) immediately don’t worry, it could be hidden under a cover like this one! Perform the same process on the GOOD vehicle (open hood, connect red clamp to positive terminal) using the other red clamp. Connect black clamp to GOOD battery’s negative terminal (note ‘-‘ sign). 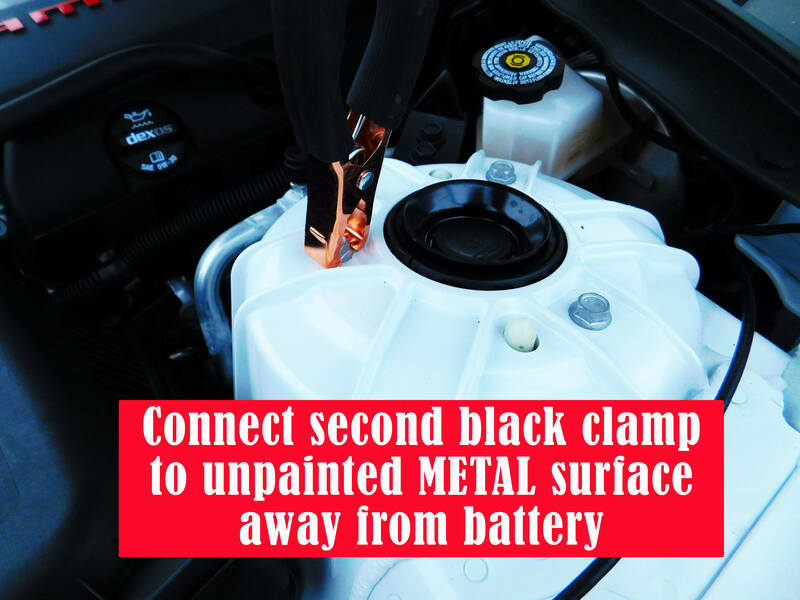 Connect other black clamp to an unpainted (bare) metal surface away from the battery on the DEAD vehicle! CAUTION: DO NOT attach the black clamp to the negative terminal. This common mistake could ignite hydrogen gas directly over the battery and cause injury- it MUST be connected to an unpainted metal surface to conduct the current! Second black clamp MUST be connect to a bare metal surface away from the battery! Start the GOOD vehicle and let it charge the DEAD vehicle for 3-5 minutes, then try to start the bad car. If it does not start check your connections and retry! CAUTION: Don’t touch a grounded part of either car with the clamp of the positive cables, and avoid belts, fans and other moving parts! AND THAT’S HOW TO JUMP START A CAR! LET US KNOW IF YOU HAVE ANY QUESTIONS IN COMMENTS BELOW!